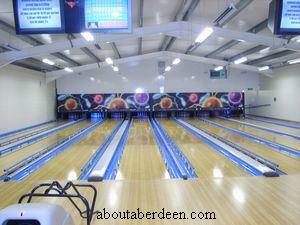 The Ten Pin Bowling Centre in Fraserburgh is located within the Fraserburgh Leisure Centre near the harbour. The ten pin bowling alley has eight lanes and is computerised. As each ten pin ball is played the computer will automatically record the score and display the results on a cartoon. Cartoons vary from Egyptian cartoons, elephant cartoons, westerns, knights, kings and many more. All highly entertaining and adding to the enjoyment when visiting the ten pin bowling centre in Fraserburgh. For example when a strike is played the screen will show a spitfire shooting out the words strike whilst a spare shows pirates on a ship. Any split skittles will be shown by a knight splitting a bowling skittle with his sword. Another feature that we have not seen in an Aberdeenshire bowling alley centre is a foul line sensor. Any bowler that steps over this line during their bowling shuffle will activate the foul line sensor and be awarded a penalty and a funny cartoon telling them they have been naughty. Members of the Fraserburgh Leisure Centre can enjoy cheaper ten pin bowling games but there is no need to be a member to play ten pin bowling.  Membership is �20 for a family, �10 for an adult and �5 for children aged under 16 years of age. A membership to the ten pin bowling centre in Fraserburgh will entitle the holder to one free game of ten pin bowling. Ten pin bowling games are cheaper during off peak times which are before 6pm during the week and before 2pm at the weekend. Bowlers can pay and play per game or per hour. Members prices are in brackets. Each price includes the hire of the red and white bowling shoes. Please note that prices may be subject to change and we encourage visitors to check directly with the Fraserburgh Leisure Centre and the Ten Pin Bowling centre in Fraserburgh for up to dates prices. The car park at Fraserburgh Leisure Centre is free with plenty of spaces and several disabled car parking spaces next to the entrance. The ten pin bowling centre in Fraserburgh is wheelchair accessible with ramps from the entrance and the bowling alley is on one level. There is a special bowling frame on each bowling alley for anyone with a disability or who finds the bowling balls too heavy or the holes awkward to use to aim their ball and roll into onto the bowling alley. Children and hopeless adults can request that the bowling alley have their bumpers raised so that any stray balls do not roll down the gutter but are rebounded back into play. Each bowling alley can accommodate a party or group of six though two lanes next to each other can be booked for increased numbers. Scoring is automatic and all you have to do is insert your names into the computer. There are four seats and a table at each bowling alley. There is a fully licensed bar which also sells non alcoholic drinks and a cafe next to the reception area sells food and snacks such as hot dogs (�2), chips (�1), children's meals (�2.50) such as shaped fish and chips, burgers and chips, etc. Healthy snacks include Panini's and toasted sandwiches. All meals are cooked fresh and generous portions are served. 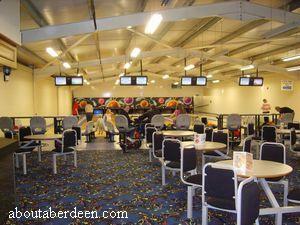 The ten pin bowling centre in Peterhead opens from 11am each day. From Monday to Thursday it closes at 10pm and on a Friday and Saturday it closes at 11pm whilst on a Sunday the closing time is 10pm. Enter Fraserburgh town (or the Broch as it is known locally) and drive past Tesco and head straight on past the Victorian fountain. At the Vauxhall car sales room turn right into Victoria Street and then take the first right beside the Seaforth video rental shop. The Fraserburgh Leisure centre is ahead and the entrance is to the left of the building past the nursery. More Aberdeenshire Ten Pin Bowling Centres.